Your home is probably the most important investment you have, and you know that all of its parts and systems have to be maintained on a regular basis to keep things humming. But while you’re up-to-date on what your house needs, have you given enough thought to keeping the landscape that frames it in top condition? Trees, flowering plants and a lush green carpet of grass are not only beautiful to live with, but they are an asset to your neighborhood and to the value of your home. What’s more, all growing things help the environment by absorbing carbon dioxide and releasing oxygen as well as trapping and and breaking down pollutants to purify the air. If your lawn is covered with snow, there’s not much to do but periodically inspect the area and remove debris and any fallen branches. 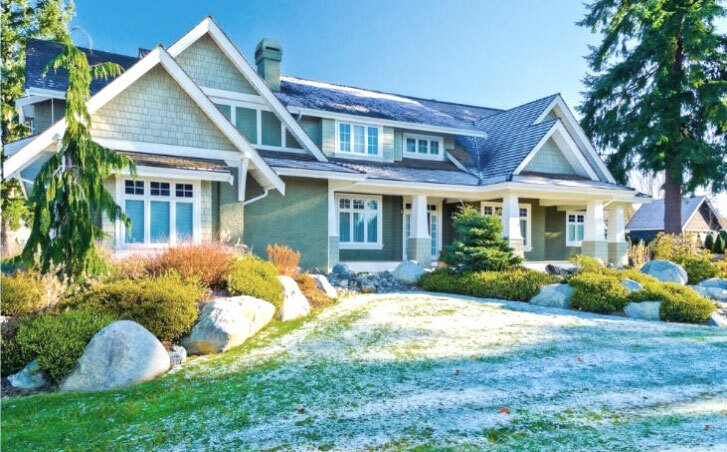 But avoid routinely walking on the lawn, and by no means ever drive or park on it because any pressure on frozen lawns can kill turfgrass crowns as well as compact the soil, leaving you with bare spots and drainage problems you’ll have to rectify later. Rake. Take the opportunity to clear the lawn of fallen leaves that provide a home for insects and invite disease. Mow. Depending upon where you live, your turf will be dormant or certainly growing more slowly in winter. For example, if you live in the TB area, lawn mowing is more important than if you’re in Fargo, but when you do mow, leave the clippings in place to serve as mulch protecting and adding nutrients to the soil. Water if necessary. Your lawn won’t be able to maintain itself if it doesn’t get an inch of water a week, so make sure you irrigate if the weather doesn’t do it for you. Oddly enough, it’s also important to water before a freeze, so that grass root zones retain enough moisture. 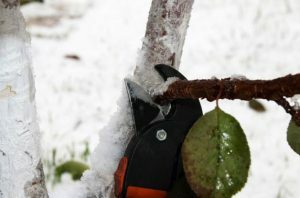 The ideal time for trimming perennial plants and pruning shrubs, hedges and trees is while they’re in winter dormancy. Roses, hydrangeas and other perennials each have their own rules, so study up before you remove branches that new growth depends on. Mature trees pose a danger if strong winds and heavy snow break off branches that can harm people and property, but don’t tackle large trees or high branches yourself; it’s worth the money to hire professionals experienced in climbing and using powerful equipment. You can trim smaller trees yourself. Just never remove more than 25 percent of a tree’s branches while leaving living branches on at least two-thirds of its height. In any case, remove only what’s necessary, like broken, diseased and damaged branches, branches that are crossing each other or growing inward and branches that are taking off in odd directions. If you didn’t get to it in the fall, there’s still time to protect plant roots from bitter temperatures that are still to come as well as to keep roots from sprouting deep in winter. Lay a good layer of mulch around plantings, but take care not to cover the trunks of shrubs and trees because the moisture held by mulch can cause rot. It’s past time to plant most bulbs, but you can still give it a try if you’re able to dig in the ground. Just plant a little deeper than usual and cover the soil with straw for insulation. You can also plant bulbs in containers. Water them only enough that the soil doesn’t completely dry out. When the weather is warmer, you can transplant them into your garden or simply let them bloom in their pots to add color to your patio or to any room in your home. Winter is also the time to start vegetable and flower seeds inside, or at the very least, sit by the fire with a stack of nursery catalogs and decide what plants to order for a beautiful summer garden.